Public opinion is in line with the Campaign’s call for action to prevent the development of killer robots. It’s time to negotiate a treaty to prohibit fully autonomous weapons. 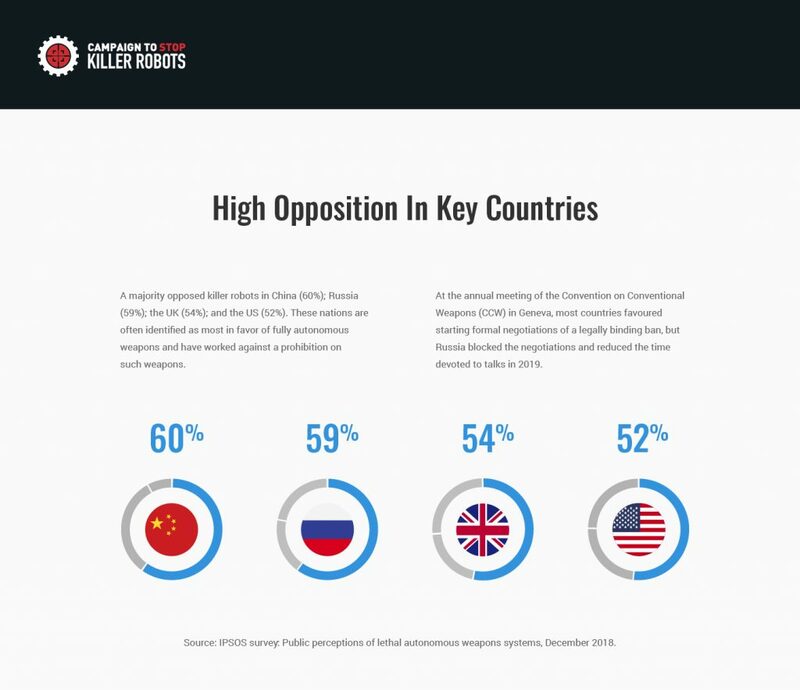 The survey of 26 countries was conducted in December 2018 by the market research company Ipsos and commissioned by the Campaign to Stop Killer Robots. It found that more than three in every five people responding to the new poll oppose the development of weapons systems that would select and attack targets without human intervention. 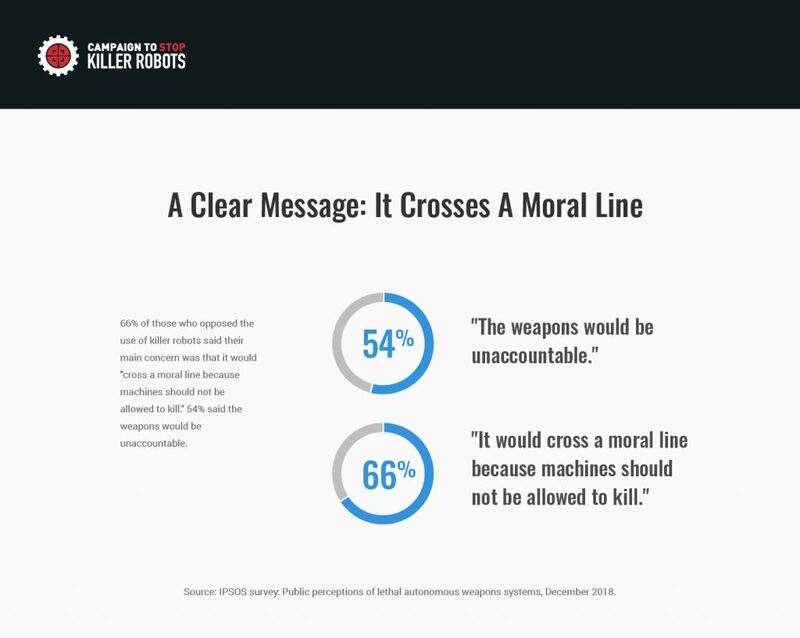 61 percent of respondents said they oppose the use of lethal autonomous weapons systems, also known as fully autonomous weapons, while 22 percent support such use and 17 percent said they were not sure. A survey conducted by the same company in January 2017 in 23 countries found that 56 percent were opposed, 24 percent not opposed, and 19 percent unsure. The 2018 Ipsos survey used respondent pools of 500 – 1,000 people in each country. The strongest opposition was in Turkey (78%), South Korea (74%), and Hungary (74%). Opposition was strong for both women (62%) and men (60%) although men are more likely to favour these weapons (26%) compared to women (18%). Opposition also increased with age: those most opposed were ages 50 to 64 (68%). Notably, the poll found in Russia, the US and the UK, nations often identified as most in favour of fully autonomous weapons, that there was a majority opposed to killer robots. In Russia, opposition was at 59 percent, 54 percent in the UK and 52 percent in the US. 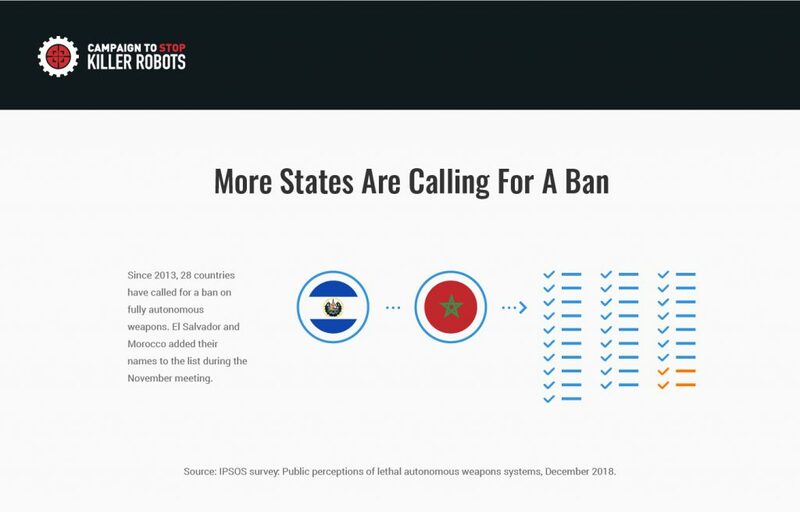 These states have actively worked against a prohibition on killer robots, with Russia recently frustrating diplomatic talks at the Convention on Conventional Weapons in November 2018 by using consensus rules to hinder meaningful progress against the wishes of the majority of states. The only countries where a majority of respondents did not oppose killer robots were India (37%), Israel (41%), Brazil (46%); and Japan (48%). In the 26 countries surveyed in 2018, 61 percent of the respondents opposed killer robots, compared with 56 percent of 23 of the same countries in 2017. 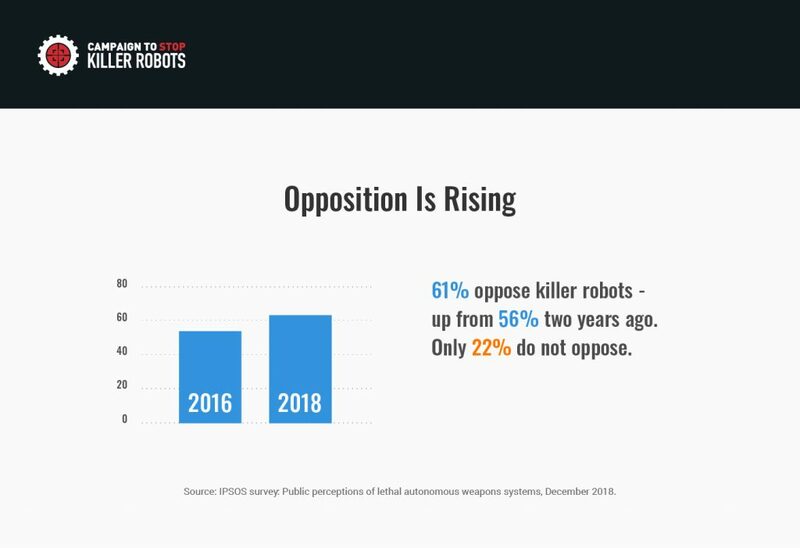 Of the 23 countries surveyed in both 2017 and 2018, opposition to killer robots increased in 14, though some of the increases are within the margin of error. The biggest increases in opposition were in: China (up 24 percentage points); Turkey (up 21 percentage points), France, Poland, Hungary (all up 13 percentage points), and South Korea (up 12 percentage points). Increases also occurred in Sweden (up 9%); US (up 7%); Germany (up 7%); India, Canada, Italy, Australia, and Belgium all also saw increases, though the increases were within the margin of error. Of the nine countries where opposition decreased, the change was just 1 percent or 2 percent in five of the countries. The only substantial decreases in opposition were in Russia (10%) and Brazil (6%). South Africa and Japan had decreases that were within the margin of error. The 26 countries that the Ipsos poll was conducted in are: Argentina, Australia, Belgium, Brazil, Canada, China, Colombia, France, Germany, Great Britain, Hungary, India, Israel, Italy, Japan, Mexico, Netherlands, Peru, Poland, Russia, South Africa, South Korea, Spain, Sweden, Turkey, and United States. The 2017 Ipsos poll was conducted in 23 of these countries, but not in Colombia, Israel, or the Netherlands. The United Nations is reviewing the strategic, legal and moral implications of lethal autonomous weapons systems. These weapons systems would be capable of independently selecting targets and attacking those targets without human intervention. They are thus different than current day “drones” where humans select and attack targets. How do you feel about the use of such lethal autonomous weapons systems in war? In the 26 countries surveyed in 2018, 61 percent of the respondents opposed killer robots, while 22 percent were not opposed, and 17 percent were unsure or undecided. A majority of respondents in 20 countries opposed killer robots. In 15 of those countries, 60 perecent or more were opposed: Turkey (78% opposed), South Korea (74%), Hungary (74%); Colombia (73%); Germany (72%); Sweden (71%), Netherlands (68%), Spain (65%), Peru (65%), Argentina (64%), Mexico (64%), Belgium (63%), Poland (62%), Canada (60%), and China (60%). 28 countries have called for a ban on fully autonomous weapons. El Salvador and Morocco added their names to the list during the November 2018 CCW meeting in Geneva. Austria, Brazil, and Chile formally proposed the urgent negotiation of “a legally-binding instrument to ensure meaningful human control over the critical functions” of weapons systems. The annual meeting of the Convention on Conventional Weapons (CCW) decided to continue diplomatic talks in 2019 but they are now moving forward with no clear objective or timetable for negotiating a treaty prohibiting the development of killer robots. This decision by the CCW did not reflect the view of the majority of nations at the meeting that countries should begin formal negotiations of a legally binding treaty. Consensus rules at the CCW enable a single country to prevent any action by the majority of countries, in this case, Russia was able to block the start of negotiations and to reduce the amount of time devoted to the talks this year. If these weapons are to be banned before they become operational, urgent action is needed. In November, UN Secretary-General Antonio Guterres, called lethal autonomous weapons systems “politically unacceptable and morally repugnant” and urged states to prohibit them. Russia, Israel, South Korea, and the United States indicated at the meeting that they would not support negotiations for a new treaty. These nations and China are investing significantly in weapons with decreasing levels of human control in their critical functions, prompting fears of widespread proliferation and arms races. Past failures by the Convention on Conventional Weapons to stem human suffering caused by antipersonnel landmines and cluster munitions resulted in external diplomatic processes that delivered life-saving treaties to ban the weapons. Those treaties were the result of partnerships between like-minded countries, UN agencies, the International Committee of the Red Cross (ICRC), and dedicated coalitions of nongovernmental organizations. The lack of agreement among nuclear weapons states to disarm led other countries to create the 2017 Treaty on the Prohibition of Nuclear Weapons via the UN General Assembly. Countries and other responsible entities should not hesitate to endorse and work for a ban on fully autonomous weapons. In June 2018, Google issued a set of ethical principles, including a commitment not to “design or deploy” artificial intelligence for use in weapons. 2018 Ipsos poll summary findings & table.